MLB Cap Clip With Two Double Sided Magnetic Markers (Nickel Finished Clip) (All Teams Available) - $10.99 - GolfersEdgeOnline.com - Best Golf Equipment On The Web! 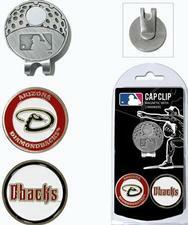 Keep track of your ball markers while showing off your team pride with the Team Golf MLB Cap Clip and Marker Set. This set includes a nickel-finish cap clip and two double-sided, magnetic ball markers with full color, enamel filled team designs. Personalize your golf game with some MLB pride when you get the Team Golf Cap Clip and Marker Set. If you have any more questions about the MLB Cap Clip With Two Double Sided Magnetic Markers (Nickel Finished Clip) (All Teams Available); do not see the model you are looking for; need custom options; or prefer to not purchase online, then please call us at (630) 656-1291.